Kofi Kingston doesn’t think the New Day has to break up to pursue singles success. 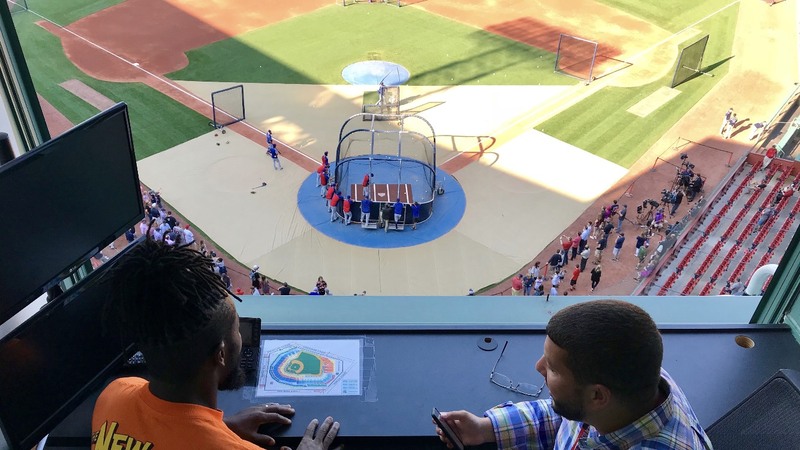 WWE’s Kofi Kingston threw out the ceremonial first pitch on Wednesday at Fenway Park in Boston before the Red Sox hosted the Rangers. Complete with a No. 18 Red Sox jersey, Kingston stood on the mound of the historic ballpark, once home to baseball legends Babe Ruth and Pedro Martinez, for his opening pitch and proudly represented WWE at “WWE Night” at Fenway. The 36-year-old Kingston, who grew up in Massachusetts and graduated from Boston College, spoke with Sports Illustrated and discussed his memories of Fenway, how WWE and MLB can learn from one another, whether he has plans to pursue a singles career separate from the New Day, as well as the New Day’s recent interactions with Kenny Omega and the Young Bucks. Justin Barrasso: Do you have any memories of Fenway Park growing up in Massachusetts? Kofi Kingston: Absolutely. After I graduated from high school, I worked at the Staples Corp. up in Framingham [Massachusetts]. We took a tour of Fenway when no one was here and I was overcome by the history. Especially now, I travel around to different arenas that have upgraded. You almost lose that old-school feel of the building. Even Madison Square Garden, we used to have terrible locker rooms in there and we’d always come out to the ring from the middle of the building, which had some charm to it. It made you feel like, ‘This is the same place where Hogan, Andre, and all these other superstars worked.’ Now everything is upgraded. Fenway is a place that has been able to keep its natural and old-school structure and feel, and I’ve always appreciated that. It’s a piece of history. JB: You brought your son with you tonight. Did you ever go to Sox games with your father? Kingston: No, I never did. My dad is actually from Ghana in West Africa, and I was actually born in Ghana, too, and came to the United States when I was two years old. It’s always football over there, soccer, but becoming a Massachusetts native, you can’t help but get sucked into all the sports. Hanging out with people from all over the nation, I realized how lucky I am to have grown up where my baseball team is good, my hockey team is good, my football team is good, and my basketball team is good. We’re just used to being winners, when a lot of other people haven’t seen a championship in their city in any sport. I’ve seen a championship in all those major sports, and it’s just awesome. JB: How can Major League Baseball learn from WWE? And what can WWE learn from MLB? KK: It’s interesting. There are a lot of similarities. Baseball is called “America’s Pastime”, but you could argue WWE and wrestling is very similar. We’ve been around since the carnival days. People want to be entertained. It’s obviously two different sports, but everyone appreciates the athleticism of another sport. When I come to a baseball game, I appreciate the athleticism of these top-tier athletes. When they come to our shows, it’s the same thing. We have all the theatrics and everything, but at the end of the day, you have to be an athlete, so there is a lot of common ground there. JB: There’s some connective tissue with referees disqualifying a wrestler and an umpire ejecting a player. KK: You’ve got to obey the rules! The refs definitely maintain order, so there are some similarities. JB: Is there anything you’ll take from your experience tonight at Fenway and bring back to the WWE locker room? KK: I respect the tradition. I’d like to take that and bring it to WWE, but I feel like we do a pretty good job of maintaining a sense of tradition, especially with the WWE Network. I keep going back and watching old shows from Madison Square Garden to see Bruno Sammartino and Bobo Brazil. JB: I know you have touched on this before, and you’ll continue to be asked this as long as you are a part of the New Day with Xavier Woods and Big E, but are you planning on pursuing a singles run in WWE? Or is your goal to fully commit to whatever platform, singles or in a team, you are presented? KK: All of us want to be top-tier singles champions. That’s the goal all the time. Now a lot of people think you have to break up to do that. We’re told, ‘You know, you have to go your separate ways.’ I think that’s the dumbest thing in the world. Why would we ever break up? We are stronger as three than we are as one. There is no need for us to break up. We always talk about having the ‘Freebird Rule,’ or now the ‘New Day Rule,’ as singles champions or even with the Money in the Bank briefcase. That would be awesome, too. We bring a different element and aspect to the potential of what a singles championship run could possibly be. Our bread and butter is in our chemistry. We’ve all done singles careers on our own, and it’s a crapshoot whether you’ll go up or go down. You never know. But we feel like we have something very special between the three of us, so there is no need to go back to doing what we were doing. JB: The New Day constantly redefines success in WWE, so why not set a new example of a group staying together–instead of splitting up–and becoming champions? Kingston: Exactly. We’re working on etching that thought in people’s minds, that idea of ‘Maybe they can do that all together.’ WWE is all about doing things that have never been done. That’s the way you get to the top and you stay at the top, so that’s what we’re always trying to do: be unique, be different, be fun, be inclusive, include the crowd, and have good times. JB: The New Day’s work at the E3 video game conference is another example of cutting-edge content. How did that experience come together? Kingston: I’m still baffled that that actually happened. Think about WWE, when was the last time you saw them do any kind of inter-promotional stuff? Not in this era, right? On top of that, with a group like Kenny Omega and the Young Bucks, The Elite, these guys are at the top of the independent scene right now. Since we became a trio, everyone’s been talking about us doing stuff with The Elite. And we came close. We actually got in there, interacted, verbally jousting, and I still get goosebumps just thinking about it. Hopefully that opens the doors for some things in the future. If it does happen, and they end up here or likewise, we had the first step in doing that. You talk about breaking barriers and breaking rules, that’s what it’s all about. You try to push that envelope and keep the wrestling business thriving, keep people interested and do things out of the box. You’ve got to go out of the box, and be able to adjust and change with the times. That’s what wrestling is all about. This is a very special time right now. You’re seeing things in the industry you never thought you’d see. You never thought you’d see AJ Styles in the WWE or you never thought you’d see Kevin Owens or Shinsuke Nakamura or Asuka in a WWE ring, but yet here we are. JB: And hopefully, within the next three years, we’ll say we saw Kofi Kingston as WWE’s world champion. Kingston Why wait three years? How about three weeks? How about three days? We’ll see. JB: If John Cena is the WWE equivalent of the New York Yankees and Roman Reigns is the Boston Red Sox, then who are the New Day? KK:: Selfishly, I want to say the Red Sox. But Woods is a Braves fan, and E, I don’t know if he’s much of a baseball fan. So you know what? We’d be the All Star team. When you want to see all the best players on one team for one night, that’s what you get when you see the New Day. We’re the all stars, doing what we do, making people smile and everyone has a good time. JB: What do you recommend for a healthy breakfast: Booty-O’s or pancakes? KK: Booty-O flavored pancakes. That’s the best of both worlds. Why segregate, you know what I’m saying? We have a nice corner of the market when it comes to breakfast foods. Everyone loves pancakes, no one wants to be booty. Mr. Bootyworth is our chef, you know what I’m saying? He’s the one who makes all of our pancakes before every show, and he does a good job. We’re always inclusive, it’s always about the inclusiveness. JB: How important is it for you to always move forward? Even though there is a little joking with Booty-O’s and pancakes, the New Day’s goal is to keep evolving in the ring and on the microphone to remain as compelling as possible. It’s possible that the group is more popular now than you were during the record-setting tag team title reign. You’re always moving forward. Is that a constant goal of yours? Kingston: You never coast. It’s not really in us—myself, Xavier, or Big E. We don’t want to just rest on our laurels. At the end of the day, it’s about the people in the ring, the characters they play, and what they bring to the table in terms of entertainment for the people. We try to bring entertainment to the max every single time we go out. We’re always thinking about, ‘What’s next? What can we do next to keep the ball rolling and not get stale?’ We just want to keep pushing forward and pushing limits.